To discuss any aspect of the garden, contact Lissanne Oliver by email or phone (9482 2884). 251 High Street, Northcote, 3070. 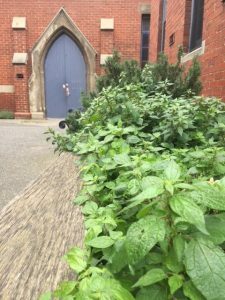 The Uniting Church has established a small orchard in the courtyard and a herb garden out the front facing High Street in Northcote. It is designed to be a place where people can take time out and relax. The herbs are used in Yuni’s Kitchen located at the back of the church courtyard. All are welcome to enjoy the church spaces and participate in the many programs on offer. If you are interested in being involved with the gardening group, contact them by email. The church also hosts a food swap on the second Saturday of the month, 11am-midday, organised by the Darebin Urban Harvesters.